I have to give credit where credit is due–this book came to me via Pechorin’s Journal. Memoirs of a Good-For-Nothing really is an odd little book, or perhaps I’m just an odd reader. Apparently the book is extremely popular and holds a certain affectionate standing in German Literature. I kept thinking I was reading a fairy tale, and according to the book’s back cover, I am not incorrect. 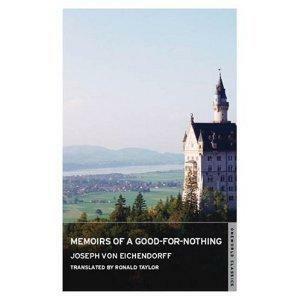 The author Joseph von Eichendorff apparently had a thing for German folk song, so perhaps it isn’t too surprising that lyrics of folk songs appear numerous times in this light-hearted, 19th century tale that charts the journey of a wastrel son. The splashing and clattering of my father’s millwheel was again in full swing, the snow on the roof was melting fast, and the twittering sparrows fluttered to and fro as I sat in the doorway and rubbed the sleep out of my eyes, revelling in the warm sunshine. The good-for-nothing son (now our hero) decides to take the hint and leaves to seek his fortune. Taking his fiddle, he hits the road. Since the hero has tremendous good luck, he largely manages to fall on his feet, and when he does veer near disaster, his good temperament and innate charm saves him. Well this is just one way of looking at it of course. Those who wish to be less generous could call the good-for-nothing an amiable idiot as he’s largely oblivious of most things in life–although I did note that he cherishes flowers and music and he even manages to fall in love. Enjoy the sights and sounds of life. Don’t dwell on the negative and ignore the bad stuff if at all possible. Have a light heart and enjoy yourself. Then I wondered if perhaps we tend to underestimate happy people. The novella’s introduction makes the point that this tale embodies the “values with which the Romantics of the nineteenth century sought, in their diverse ways, to infuse their lives and their art.” I recently read Goethe’s The Man of Fifty which was first published in 1829. Memoirs of a Good-for-Nothing was published just a few years before in 1826. While both novels, written under the mantle of German Romanticism, yield completely different subject matter, there is a similar generosity of spirit and a refreshing forgiveness of human foibles found in both volumes. Your final summary makes this sound an appealing book, Guy, despite the passing annoyance you described earlier. Interesting as well when a totally contrasting book suggests itself as the next one up, rather then something similar or related. Or was Bukowski a deliberate choice? I selected Bukowski because I wanted something modern in contrast to the memoirs . I didn’t know in advance how nasty Post Office would be (and I mean that as a compliment). The two books are so different and yet there are some rather strange similarities. I’m looking forward to reviewing it next. It’s held up well in my memory this one, it’s actually surprisingly charming isn’t it? I loved how there’s this grand conspiracy plot going on which the hero remains utterly oblivious to. Also, there’s a wonderful scene where he encounters a group of musicians hanging out by a particularly scenic view. They’re there hoping to ambush any English lord who might pause to enjoy the scene and so might pay them to go away. Marvellous. And yes, generous and forgiving, good words for it. I’m glad you liked it, it’s a surprising one and it’s nice to have a picaresque where there’s not really any picaro but more a sort of amiable fool. Curious to see what you make of Post Office. I really liked it I recall. The review of Post Office will be up this weekend if all goes as planned. In The Memoirs, it seems as though everyone else is up to something–some sort of subterfuge or another. The exception to this is, of course, the good-for-nothing, a man whose mind is very close to a blank slate. In his case this acts as a sort of protection more than anything else. Thanks for the comment. It’s been a few years now since I read this, but my memory of the novel still gels with the review.